When we go to the grocery store we can never really tell if the fruit or vegetables are bad until we sink our teeth into dry, pulpy disappointment. We all have books on our shelves we’ve loathed, books that make us mourn the trees sacrificed for nothing and that we’ve judged not worth the time stolen to read them. 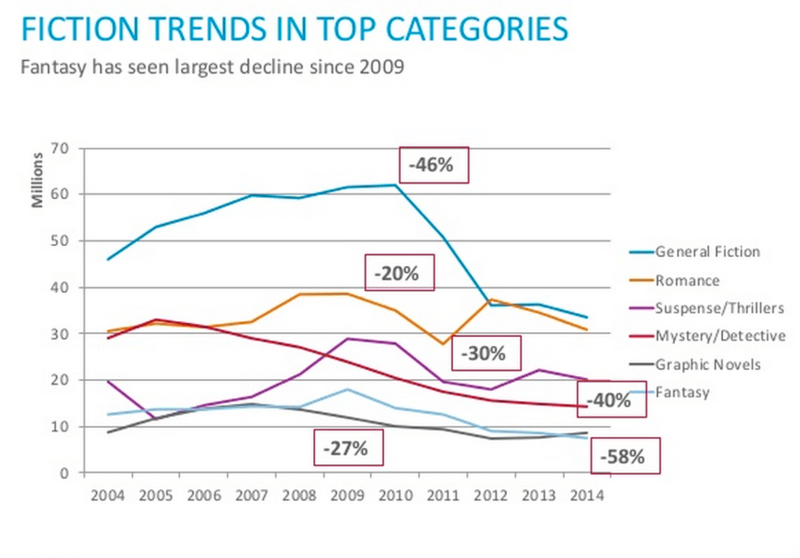 If you believe this Nielsen data graph (courtesy of ingenta.com) on the performance of fiction in the marketplace, you have to know it represents people increasingly becoming disappointed in fiction. And yes, that’s a nearly 50% drop you see there in General Fiction over the course of a mere decade. You also have to know that the true statistic would be far worse if they included readers who keep buying books that keep on disappointing but there’s no way to count disgust or disinterest after good money has already been laid down. Just for funsies, how many of you out there have ever returned a novel because it stunk? It would be interesting to find out. But more importantly it would be interesting to find out why readers don’t return terrible books, so in the comments section tell us why you don’t treat rotten fiction like rotten fruit. Should we be sending that message to the industry and to writers for failing readers?